Following last year’s publication of the “Drawing the Future” report at Davos, Education and Employers has been liaising with the primary and secondary schools in Davos. 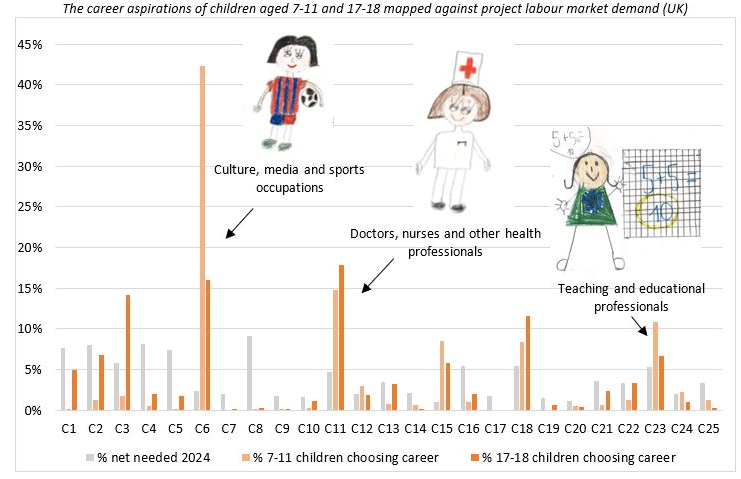 Asked to draw the jobs that they would like to do when they grow up, this table shows the results. Strikingly, the jobs they chose were based on solely on the jobs their parents did or that they were familiar with from their immediate environment. For the first time ever, delegates who were attending the World Economic Forum in Davos took time out of their very busy schedules to visit the local primary school. The event started with a welcome to the guests and then Andreas Schleicher, Director, Education and Skills OECD, answered questions from the children about his job in German. He then ‘took’ them on a world tour of his work commitments over the last year. A novel type of geography lesson! After that the delegates and Andreas went into the classrooms and talked in small groups to the children about their jobs and careers. A number of the delegates spoke German and for those who didn’t a number of parents kindly acted as translators. The pupils had the chance to find out more about the myriad of careers of the volunteers. The event not only allowed the delegates for the first time to inspire young people but also to hear about their hopes and aspirations as leaders and employers of the future. ‘Joining the event, was the head teacher of the secondary school, Marco Schneider. He is also very keen to provide a similar opportunity for his students,’ he concluded.